Rav. Steinberg was born in Hoff, Germany. He studied in the Rabbinic Academy of Yeshivat Harav Kook, Jerusalem after which he studied medicine and completed his internship in the HebrewUniversity Hadassa Medical School, Jerusalem, and is the current editor of the Talmudical Encyclopaedia. Rav. Steinberg served as a Medical Officer in the Israeli Air Force. He was a resident in the department of Paediatrics, Shaare Zedek, and the department of Neurology, Albert Einstein College of Medicine and Montefiore Hospital Medical Centre, Bronx, New York, after which he became a fellow in same department of the Albert Einstein College. He has acted as attending physician in Shaare Zedek Medical Centre and Bikur Cholim Hospital Jerusalem, Israel. Former director of The Schlesinger Institute, Rav. 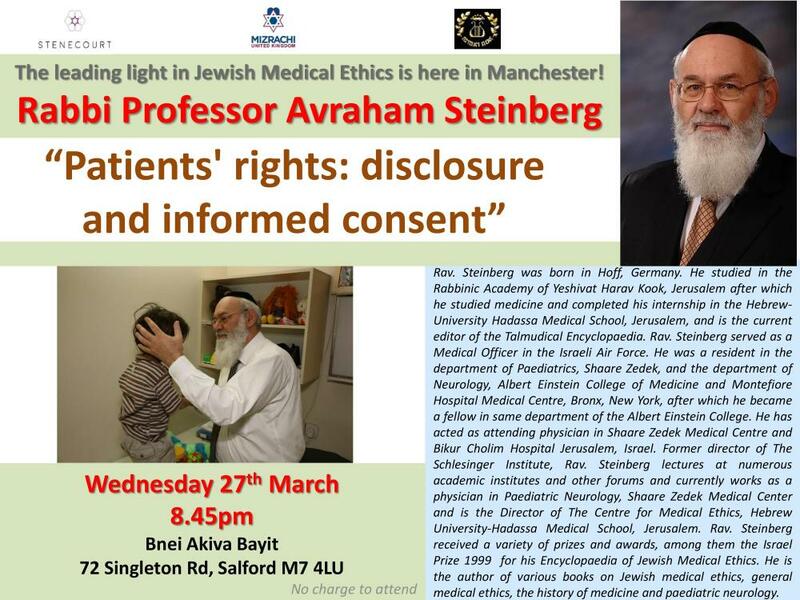 Steinberg lectures at numerous academic institutes and other forums and currently works as a physician in Paediatric Neurology, Shaare Zedek Medical Center and is the Director of The Centre for Medical Ethics, Hebrew University-Hadassa Medical School, Jerusalem. Rav. Steinberg received a variety of prizes and awards, among them the Israel Prize 1999 for his Encyclopaedia of Jewish Medical Ethics. He is the author of various books on Jewish medical ethics, general medical ethics, the history of medicine and paediatric neurology.